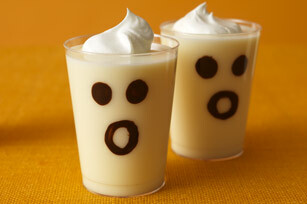 Celebrate Halloween with a cool and creamy Spooky Ghost Shake. Made with vanilla pudding, semi-sweet chocolate and COOL WHIP, this recipe for our Spooky Ghost Shake tastes just as delicious as it sounds. Melt chocolate in microwaveable bowl on HIGH 1 min., stirring after 30 sec. Stir until chocolate is completely melted. Use clean small paintbrush to paint a ghost face on inside of each of 4 clear 8-oz. plastic cups with the melted chocolate. Refrigerate until ready to use. Trim 100 calories and 4.5 grams of fat per serving by preparing with fat-free milk, JELL-O Vanilla Flavor Sugar Free Fat Free Instant Pudding and COOL WHIP LITE Whipped Topping. If pitcher with tight fitting lid is not available, prepare in blender.